The ever-evolving Resident Evil survival horror series always keeps things fresh (or should that be rotten!). In this 3DS exclusive (set between chapters 4 & 5), Terragrigia, a utopian solar powered floating city is destroyed to stop the terrorist organization Il Veltro's unleashed bio-organic attack. Shapely Raccoon City survivor and former S.T.A.R.S. operative Jill Valentine is a founding member of the BSAA (Bioterrorism Security Assessment Alliance), and here with her new partner Parker searches for Resident Evil veteran Chris Redfield and his partner Jessica, who disappeared on a BSAA assignment. Their last location is the SS Queen Zenobia, a deserted cruise liner in the middle of the Mediterranean. The ship allows for a vast amount of creepy locations for exploration and puzzle solving, and of course ghastly new creatures to accost you in your search. The new Genesis scanner does more than just viral detection and analysis, you can also use it to find essential hidden items (in addition to the regular ammo and health herb collection). Besides the in-depth Campaign Mode, Raid Mode allows for a co-operative enemy battle onslaught in both Local- and Online Play functions. The special Circle Pad Pro expansion peripheral clips to the bottom of your 3DS unit, adding extra shoulder buttons and right hand joystick. This vastly improves your character mobility and functions like a console game's joypad, freeing up the Nintendo's directional and ABXY buttons for quick functions like weapon switching or health restoration and emotion expression. With the touch screen the combination of the Circle Pad Pro makes this one hell of a control system. 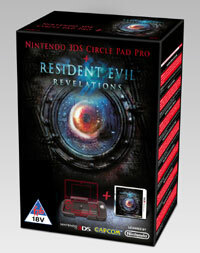 Don't hesitate to get the pack including the Circle Pad, as it will no doubt come in handy with future DS releases.